Andrew Karam isn’t your average nine-year-old. While most kids his age ask for the latest must-have toy for their birthdays, Andrew requested shares in Apple. His parents bought him $120-worth and Andrew watched the price of the stock with interest, checking regularly whether his investment had gone up or down in value. Andrew’s dad, Steve, later told him about bitcoin and the schoolboy was well and truly hooked. “He was incredibly excited about it and asked if I could take his Apple stock and cash it out for BTC, so I made him a paper wallet and … bought a bit at a time during the recent dip,” Steve wrote in a post on reddit. 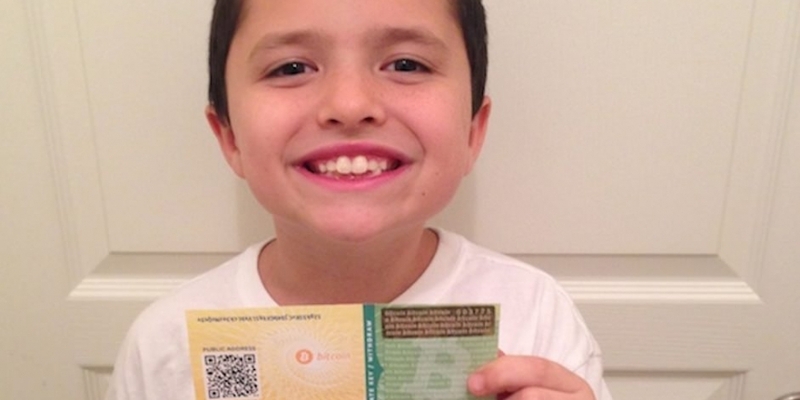 Andrew recently told his teacher about his investment, revealing he had made about $50 since his dad bought him some bitcoins. He said he was originally thinking of cashing out 25% of his investment, but the savvy youngster now wants to hold on to his cryptocurrency after hearing how well the Senate hearings went last week. “[It’s] safe to say my son is bullish at this point,” said Steve. Andrew also came up with a new idea – a concept known to you and me as ‘day trading’, but previously unbeknownst to the young New Jersey resident. “He told me that he had an idea, that he could sell bitcoin when it goes up [in price] and buy it again when it goes down. I told him it was a great idea, but costly and a gamble even with the right knowledge, and told him sticking to buy and hold is a much better choice right now. He agreed,” said Steve. The assistant principal at Andrew’s school was impressed with his newfound hobby and passion for saving, and asked him to give a presentation on bitcoin in his maths class. Bitcoins are created by really powerful computers solving insane math problems. That’s called mining. The problems get harder and harder when more bitcoins get mined. Bitcoins are digital money. It’s kind of like money in online games except you can buy real things with it. My paper wallet isn’t just a wallet, it’s like my own bank. People can use [it] to give me money. Inside the secret area is my key that lets me use the money. No one’s allowed to ever see it but me or else it’s like they broke into my bank. There will only be 21 million bitcoins ever made! And I own .32164308 of them. Andrew wants to do more than just a talk at school to get his peers involved in digital currency. 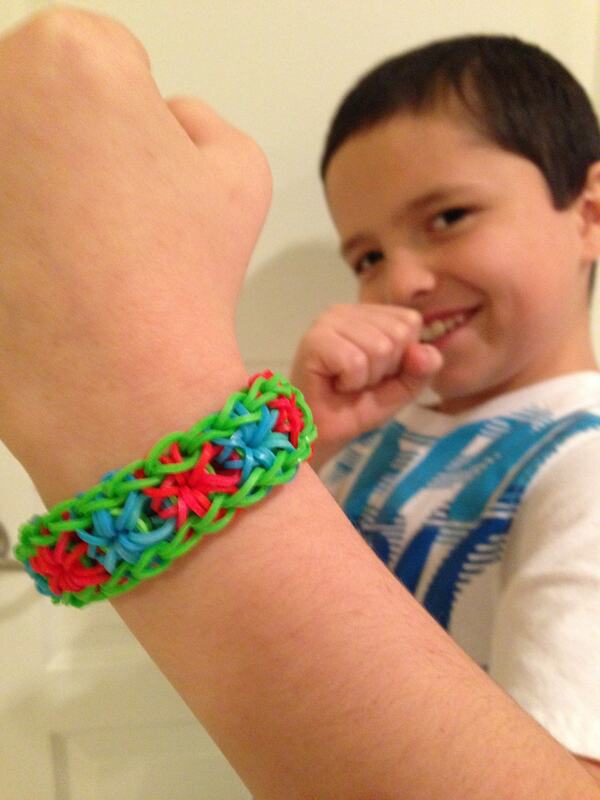 He asked his dad whether he could sell bitcoins to his classmates, then get them back by accepting BTC as payment for his Wonder Bracelets, which he makes from colourful elastic bands. 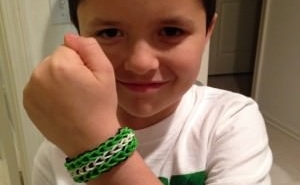 Steve said some of their parents might have a problem with this, but he’s set up an online store for the aspiring entrepreneur called Bracelets for Bitcoins. Andrew made his first sale earlier this week to a bitcoin fan in Ireland. “I have to say I really am so impressed that a nine-year-old has just managed to sell one of his creations to an international buyer without any government interference, registration or payment problems – and with just a sprinkling of help from his dad, of course! This kid is going places and you’ve definitely got him on the right track,” the buyer said in a reddit post. Andrew’s story and enthusiasm has really struck a chord within the bitcoin community, with some members of reddit making donations to Steve, which are then transferred to the 4th grader’s bitcoin wallet. Steve said his son is “super excited” by all the support he is getting and even commented that he wants to be a “professional millionaire” when he grows up. He said he wants his friends to learn about bitcoin so they can buy from his shop and see what technology can now do. “I think they would really like not having to worry about remembering to bring money to school or shopping because they can just have their phone or something and pay with bitcoin any time,” Andrew added. Steve used bitcoinpaperwallet.com to create a paper wallet for Andrew to store his bitcoins in – news the site’s founder Canton Becker was ecstatic to hear. “Inspiring story. This is exactly how I hoped my design would be used. Kudos to your son,” he said to Steve. So, what next for the young bitcoin addict? 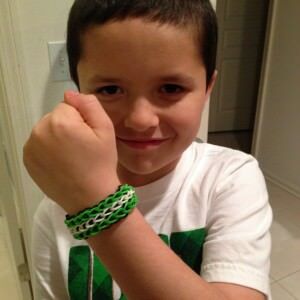 Steve said Andrew is spending a load of his free time making more Wonder Bracelets to replenish the stock on his store. “I posted about his online shop on reddit yesterday and it’s already had over 1,500 views and sold out of all his stock!” Steve added.